Stress Management Tip #2: Ask Yourself: “Is This the Number I Want?” | Work Well. Be Well. Let’s begin with a quick review of Tip #1: “Give your stress a number.” You could use a 1-10 scale, grade yourself A-F, or you could even use colors, with green, yellow, and red denoting mild, moderate, and severe. The idea is to come up with some simple way to quantify your stress level and track it over time. This gives you two important pieces of information: whether your stress levels are healthy or dangerous, and whether they are getting better or worse. If you are experiencing moderate or severe stress, but trending in the right direction, then keep doing what you are doing. But if you are stuck in a bad place, or moving in the wrong direction, you need to make changes. Otherwise, you’re headed for trouble. Once you’ve tracked your stress level, you’re ready for Tip #2: Is this the number (or letter, or color) I want? To answer that big question, it might help to break it down into six bite-size pieces. 1. Is my level of dis-stress sustainable? When it comes to running, most of us can sprint for a short distance. But after a few hundred yards, everybody breaks down. And so it is with stress. Most can tolerate high levels of stress in the short run. But few can sustain it indefinitely. If you have one or two big deadlines to gear up for, you can do it, and it can be rewarding to focus, concentrate, pull together as a team, and, as we say in Texas, “git ‘er done.” But if, as soon as you meet one deadline, you’ve got to gear up for another, and maybe even another, it will break you down, and also your team. So we’ve got to be honest with ourselves and our co-workers: Is this level of dis-stress sustainable? When are we taking our breaks? When is our down time? When are we switching gears to focus on some low-stress work activities? 2. Is my level of dis-stress good for my health? We know that high stress levels are associated with heart disease and a number of other physical and mental health problems as well. Whether the stress actually causes these problems is a matter of debate—they may be the collateral damage of a whole host of unhealthy practices that accompany a high-stress work-style and lifestyle. Practically speaking, what matters is how long you want to live, and what quality of life you’d like to have, health-wise. And whether you’d prefer to be a role model of healthy living or a sacrificial lamb on the altar of corporate performance, personal ambition, wealth, prestige, or fame. From my experience in the health and teaching professions, I know it’s not always money and power that drives people to sacrifice their health for their careers. Many in the service professions are motivated primarily by altruism. And that’s a good thing. When they sacrifice their own health in the service of others, they become modern-day saints and martyrs. Which is also a good thing–sort of. I know many doctors and nurses who themselves do not get regular medical check-ups, who don’t have time for exercise, and who work when they themselves are sick. This is admirable, but I’d also ask them to consider the benefits of practicing what you preach, being a role model of healthy living, and being healthier in the short run so that you can live to serve in the long run. 3. Is my level of dis-stress good for my family? If you have no spouses or partners, children or grandchildren, parents or grandparents, or close friends who depend on you, you can ignore this question. But if you do, consider whether your current level of dis-stress is causing any collateral damage to your family. Are you so preoccupied with workplace stress that you are not emotionally available to your family? Are you so busy getting “A’s” at work that you are getting “C’s” at home? Are you tired and irritable when you get home from work in the evening? Are you at home in name only—but actually in your study getting work done? Are your huge work and stress loads your excuse for asking your spouse to bear an unfair share of the home workload? Ask yourself: What is it about my job that motivates me to be so good at it, and what is it about my home life that fails to bring out the best in me? How can I create incentives at home to make me a superstar there, and not just at work? 4. Is your level of dis-stress good for your patients, clients, or customers? The doctor assumed that her patients appreciated the fact that she sacrificed her own health for that of her patients. But in this moment of truth she discovered that at least some of them preferred to be cared for by a doctor who was herself strong and healthy—in a state of energy surplus rather than deficit. Put yourself in the patient’s shoes: Would you want to be cared for by a doctor or nurse who sends out the message that they need you to care for them? And the same applies for other service professions: teachers and students; counselors and clients; retail sales professionals and their customers. You’ll do your best work from a state of energy surplus, not a state of energy deficit. 5. Is your level of dis-stress good for your colleagues and co-workers? Let’s say you’re the type who thrives on pressure. You get a thrill from meeting deadlines at the very last minute. You enjoy spending late nights at the office and weekends. Perhaps you’re an adrenaline junkie. Perhaps you’re a procrastinator. Or perhaps you’re someone who doesn’t have a life. Or perhaps all three. You say how you get your work done is your business. I say you’re wrong. In most jobs and most careers, other people have to work with you. And in all likelihood they will not be adrenaline junkies, procrastinators, and people who have nothing else to do on their evenings and weekends. They will have families, friends, community activities, and other relationship priorities. They will have healthy lifestyle priorities such as exercising sleeping, and hobbies. When your work-style looks more like a typhoon than a steady breeze, you make work and life miserable for all those around you. What gives you an adrenaline rush gives others anxiety and dysphoria. While you are getting turned on by the frenzy of activity, others are getting turned off by all the noise and conflict, anger and irritability that go with it. 6. Is your level of dis-stress normal? I added this final question because I find that many of the people I counsel can answer “no” to the first 5 questions, but they still rationalize their behavior by saying, “It’s normal.” What they mean is that it’s normal within a very narrow professional subculture they have chosen to identify with. What they mean is that most other people in their profession work the same number of hours and experience the same high levels of stress. I interpret this to mean that their high-stress work-style has become for them a badge of honor, a proof that they are doing something truly important, that they are working as hard as the other workaholics around them. Have you noticed that the parents of your children’s friends—especially the ones your children most enjoy hanging out with—actually have time to hang out with friends and neighbors on the weekend, coach their daughter’s softball team, attend a popular movie when it first comes out (not watch it a year later on Netflix! ), or attend their church, synagogue, mosque, or temple on the weekend? Do you think those other parents bring their work home with them? Are they mentally at work when they are physically at home? In the evenings do they stay exercised and energized over workplace problems and politics yet fail to notice anything that goes on around the own home? Have you ever considered adopting a “new normal”? Is your sense of normal based on a very small sample of people who are obsessed and distressed with their work and unhappy doing anything but work? Have you ever considered finding a whole new set of friends who don’t care what kind of work you do or how much money you make, but pay more attention to the content of your character? If your stress level is so severe that it’s about to push you over the edge, you need to dial 911 and make drastic changes in your work-style and lifestyle. But if you’re stress levels are moderate—i.e. you’re surviving but not thriving—then I hope my six questions can help you figure out what you need, what you want, and where your priorities ought to be. And remember, it’s not only about being healthy and happy: feeling good and looking good. It’s also about being good, as in being a good person: at home and at work, in our families and in our communities. 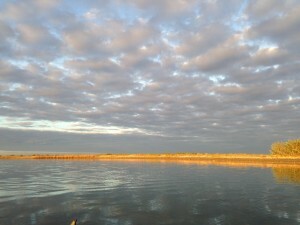 The photo was taken at sunrise in Christmas Bay, just south of Galveston. It’s a “sacred” place I go to to refresh, renew, and recalibrate–and sometimes catch a fish or two. When I’m there I can’t help but think of that old Irish melody and hymn made popular by Cat Stevens (Yusuf Islam): “Morning has broken like the first morning.” It feels as though I’ve arrived for a concert, and all creation is singing that hymn just for me. My wife took this photo with her cell phone. We had paddled out there in the dark of night using our headlamps, then the light began to show on the horizon, and the concert began. And of course my stress rating was a 1 on a 1-10 scale.